Several organizations have filed formal protest against a water rights application filed in January, which proposes diverting water from the Green River in Utah over the Continental Divide to Colorado’s Front Range. The application, filed by Aaron Million’s Water Horses LLC, calls for 55,000-acre-feet of water to be used in a hydroelectric power facility, likely in Wyoming, before becoming available for consumptive use and in-stream flows on the Front Range. It proposes two pump stations on Bureau of Land Management land about 5 miles west of the state line in Dagget County, Utah, just before the river takes its 41-mile turn into Moffat County. It would take about 500 miles of pipeline to divert the water from Utah north and east into Wyoming and the Front Range. The location of the hydroelectric facility “will be determined at a later date, following additional project design and engineering,” according to the application. Thirty two formal letters of protest from 27 individuals and organizations were submitted to the Utah State Engineer. Protests came from a wide swath of organizations, including a labor union on Water Horse Resources’ project team, an energy company, several environmental nonprofits, private individuals and state and federal agencies. The public protest period on the project closed April 7. Now, the Utah Division of Water Resources will make a decision on whether to grant the water right. Once the decision comes out, it could be appealed in court. “It’s just a disagreeable idea to have water from this side of the mountain going over to the other side of the mountain for development purposes, maybe even speculative development purposes, at that,” said Terry Carwile, a Craig resident who sent a letter of protest on the project. The project would cost about $890 million, according to a news release from Water Horse Resources LLC. The company has nicknamed it the “Grasshopper Project,” a play on the pronunciation of an acronym of the project’s full name, Green Sun Storage Hydro Power. In the news release, Million said that “surpluses out of the Green River can alleviate some issues on the Front Range and take pressure off the high mountain Colorado River headwaters, like the Blue and Fraser River.” Million thinks the project would help net flows on the Colorado River. “The Green River is one of the remaining watersheds in the Colorado River Basin — specifically in Colorado – that isn’t completely allocated. The state and management/planning entities in the water community want to be able to plan appropriately for the future use of that water,” said Zane Kessler, a spokesperson for the Colorado River District, the organization that operates Elkhead Reservoir and is largely responsible for management of water in the Colorado River Basin. “The application that we’re looking at now, filed by Mr. Million, would essentially usurp our ability to collectively plan for the appropriate development of the remaining and dwindling water resources that we have at our disposal,” he added. Kessler said the Colorado River District is concerned the proposal could have far-reaching impacts. The district is worried the proposal could “push us over the cliff,” in meeting obligations to send water downstream under the Colorado River Compact. Should this project over-allocate water in the Upper Colorado River Basin, Colorado water users could be forced to reduce use. In Utah, state officials are concerned about impacts to Green River users, as well as the state’s ability to manage for endangered fish. In a letter of protest filed by the Utah Board of Water Resources, officials also question whether the state of Colorado would count the diversion against Colorado’s allocation under the Colorado River Compact. The Colorado River Water Conservation District is opposing a water developer’s plan to divert water from the Green River in Utah and pipe it to growing Front Range communities. The River District formally opposed the proposal by Aaron Million and Water Horse Resources LLC for a Utah water right to divert 55,000 acre-feet of water annually from the Green River and pipe it to the fast-growing metro area. Million’s proposal is similar to, but smaller, than a previous proposal to pump water out of Flaming Gorge Reservoir in Wyoming and pipe it across the Continental Divide. The River District complained in a filing with the Utah Division of Water Rights that Million’s proposal was speculative in that he had failed to specify a use or need for the water and noted that he should first obtain a Colorado water right. Under Interior Department estimates, about 500,000 acre-feet of water remain to be appropriated in the Colorado River system and his project could reduce stress on the headwaters of the Colorado River, Million said. The River District’s objection to a Utah water right for the project also noted that Million had not demonstrated he could operate the plan in compliance with the Colorado water plan’s conceptual framework on transmountain diversions. The current proposal, like Million’s last one, is predicated on the idea that Colorado has a right to water from the Green River because it takes a “41-mile dogleg” into Colorado after leaving Wyoming and heading into Utah. The River District urged the Utah agency to reject Million’s request unless he can prove the project won’t “adversely impact existing water uses in the Upper Basin” of the river and that it would not be detrimental to the public welfare. The Utah water resources board is appointed by Utah’s governor to develop and conserve the state’s water. The decision on Million’s water right proposal will be made by Utah’s state engineer, who heads the state’s Division of Water Rights. The river district filed a protest against Million’s new proposal. So did the U.S. Bureau of Reclamation, several conservation groups, and several local water conservancy districts and water users associations in Utah. The Utah water resources board and division say in their letter that the current application “will have huge impacts in Utah,” affecting water supply and quality in the state even as its population is growing and its water needs are increasing, and impacting public recreation and the stream environment along the Green River. They question the physical and economic feasibility of piping the water “over or around the Rocky Mountains” for use on the Front Range, and say the application was filed for speculative purposes. “Nothing in the vague application outlines actual beneficial uses in Colorado. No contracts or other types of agreements are provided demonstrating that Colorado can beneficially use the water, or for what beneficial uses it would be employed,” the letter says. Million says he had subscribed interest for 400,000 acre-feet of water for the previous project, and demand for water has gone up since then. He estimates that the project could cost up to $1 billion, down from an estimated $2.8 billion for the previous one, and says a tripling in the cost of water on the Front Range helps make the project economic. Million said other similar projects already exist in the Upper Colorado River Basin, and he noted that Utah is pursuing a project that would involve diverting water out of the Arizona portion of Lake Powell and piping it into Utah. The Center for Biological Diversity filed a protest today with Utah’s state engineer challenging a water-rights application from Water Horse Resources to pump nearly 18 billion gallons of water each year from Utah’s Green River over the Rocky Mountains to Colorado’s Front Range. The plan is the second attempt by would-be water developer Aaron Million to pump water from the Green River to the Front Range. Million’s first plan was rejected twice by the Federal Energy Regulatory Commission in 2012 following challenges by conservation groups and others. Today’s protest states that the application violates state law by failing to identify beneficial uses of the water and by exacerbating water shortages. The withdrawal would overallocate water in the Green River, a tributary of the Colorado River, and add to climate-driven flow declines. The application is predicated on using Colorado’s apportionment under the Upper Colorado River Compact, but provides no evidence that Colorado has agreed, or will agree, to this. 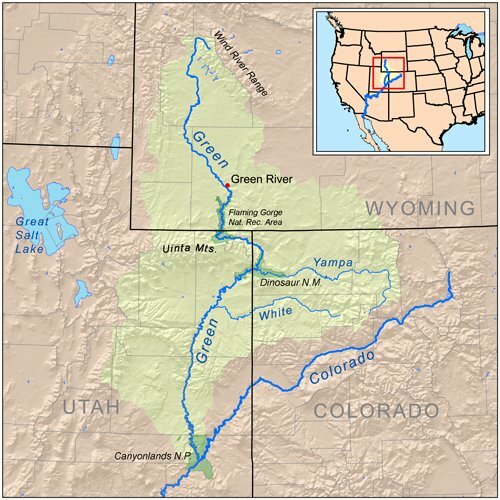 The water withdrawals would occur below Flaming Gorge Dam in a part of the Green River that is critical to the recovery of Colorado pikeminnow and other endangered fish. The withdrawal would reduce river flows designed to help increase the fish population at a time when failure to meet recovery flows already imperils the fish. Drought is expected to cause low river flows throughout the Upper Colorado River Basin this year. Download a copy of today’s protest. Link to Utah Division of Water Rights website for the project via Aspen Journalism.